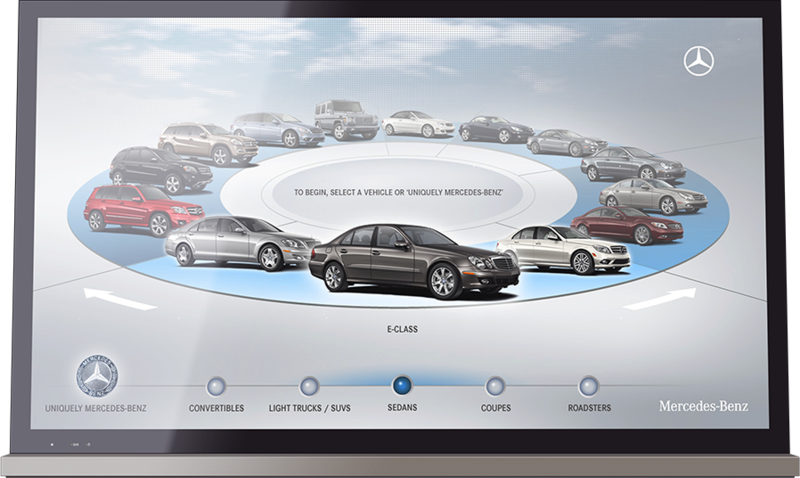 Traditionally, when a customer came into the dealership to discuss and compare Mercedes-Benz among its competitors, the sales advisor would have to rely on print brochures and what inventory was available on-site to communicate M-B's unique features and benefits. Often times, the customer's exact specifications were not available on-site. 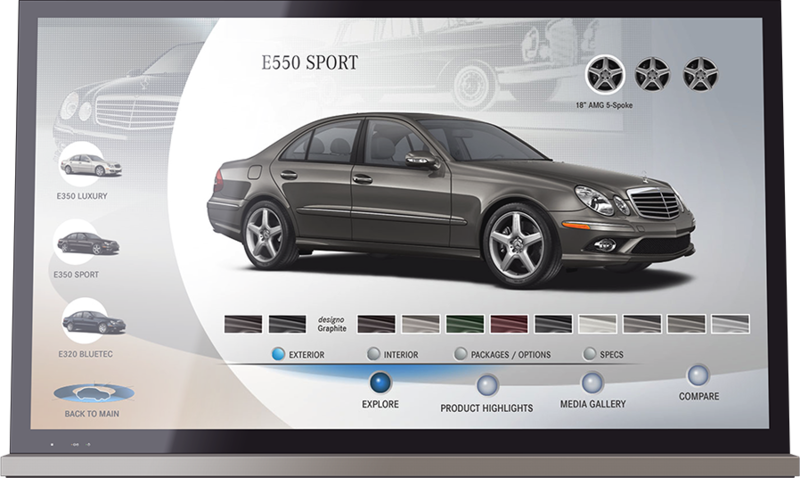 We designed an interface on a large, touchscreen monitor that served to facilitate a more dynamic conversation between sales advisors and customers. I was one of three members of the design team who brainstormed the high level interaction and visual design concepts. After the initial concept was chosen, I was responsible for content gathering, nailing down the details of user flows, information architecture, and interactions. The main screen was intended to showcase all vehicle models in an engaging way. 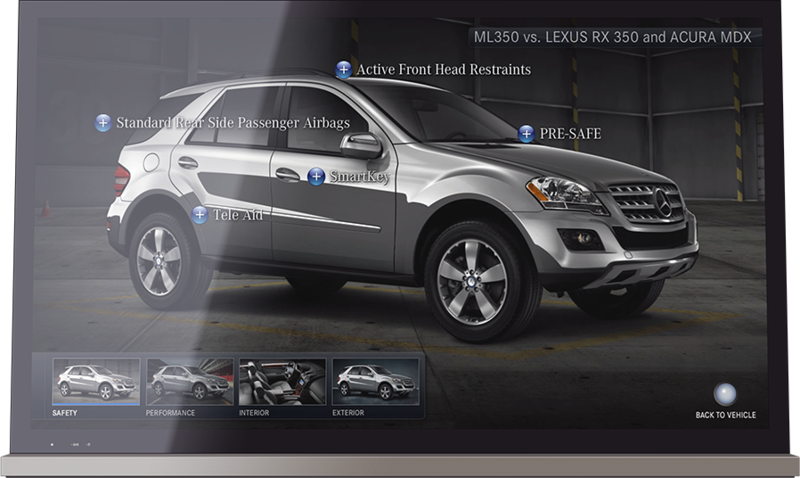 The product detail screen allowed customers to play with different options instantly. Comparisons between competitors were also incorporated address common questions during the buying process. After launch, I designed the ongoing asset production system to allow for easy updating. Since there wasn't a healthy timeframe to update the Visualizer once specifications were finalized, this was crucial. 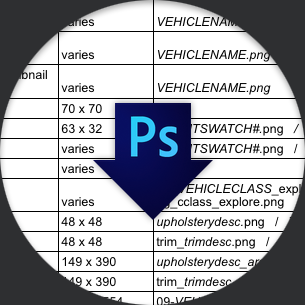 Using a combination of Photoshop droplets, logical naming conventions and templates, the team was able to stay sane when model year updates came around. Lessons learned I’d be remiss if I didn’t admit to some glaring issues that we observed while building. It had to do with the ergonomics of the kiosk itself. Once we got a model of the final kiosk in-house, we found that the kiosk stand didn't allow for easy height adjustment. What if the customers or advisors were shorter? The experience was kinda like sitting in the front row of a movie theater. The screen got really hot to the touch after a few hours of being on. Although we didn't have any interactions that required a drag, we still would have made it more of a priority had we been aware of this issue before hundreds of units were ordered. Now, let's talk about how I can help.